Emily Bay may be the most popular beach on Norfolk (and for good reason - it's beautiful!) but did you know there's quite a few other places hidden around the island that are just as breathtaking? Maybe you've heard whispers of them or seen the photos and wondered. Well, here's a quick rundown of some of the lesser known 'hidden gems' that Norfolk Island has on offer! You're standing on a sandy beach, the kind of sand so pure it feels like sherbet underneath your bare feet. All that can be heard is the lapping of ocean waves and the distant calls of the birds above, soaring around the surrounding cliffs. 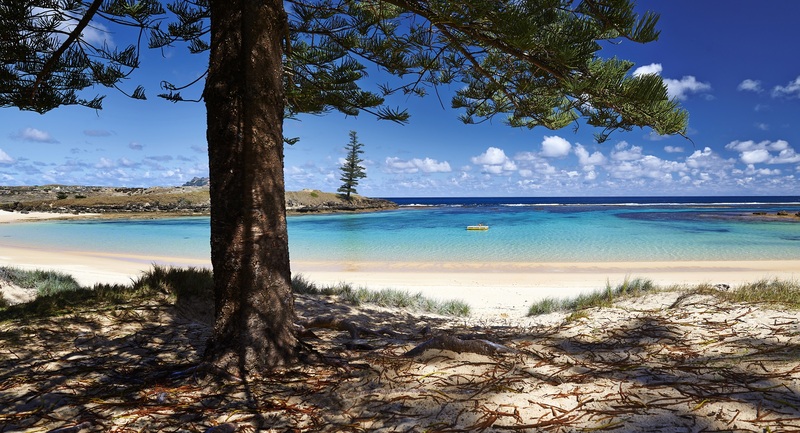 You've found Anson Bay, one of Norfolk Island's hidden gems. A winding access trail leads down to this picture perfect beach and if you're lucky enough (which is more often than not) you'll have the whole place to yourself! A short boardwalk through pine forest and past a freshwater creek will lead you to a small beach known simply as "Bumboras". A shallow and sheltered bay where you can snorkel amongst friendly fish, coral and anemones or even go for a paddle board on a calm day. There's a few rock pools for a refreshing dip and plenty of shells to be admired along the edges of the tide. This beach is great for little explorers as they can be left to wander in safety while you relax on the beach. A beautiful view of Nepean and Phillip Island can be seen from here, but don't forget to look behind you at the magnificent pines! These pools have to be seen to be believed. A little climb down the cliff (don't worry it's only a small one!) and you'll find yourself on a rock ledge ready to jump into the beautiful 'crystal' clear rock pools. These pools are fully cut off from the ocean on the other side so on a calm day they are perfectly still and just waiting for you to float around in absolute tranquillity. Not the easiest place to get to, but definitely worth the effort, is The Chord. A large rock pool formation found right next to the original landing site of Captain Cook. Pack a snorkel and mask as this pool contains some of the most fantastic anemones you'll ever see, along with plenty of corals and friendly fish. The main part of this pool is just under 3m deep and has a flat sandy bottom, the water is clear and calm at low tide - just like a pool should be! Please be aware that these locations are subject to ocean conditions such as rip currents, large swells and tides, rope/ladder climbs and some access roads are impassible if wet. Ask a local the best times to visit each one and consider the option of a guided tour to ensure your safety.